5 Responses to Is it Possible? A Universe From Nothing? …there is no way around the obvious :If nothing existed before the Big Ba-da-boom,then WHERE did it take place?And we do not see anywhere an example of something coming from nothing;like people are coming from people everything comes,through transformations,from past materials-but if no Universe ;so much material ,with billions of Galaxies (w.trillions of Suns and quadrillions of Planets and Moons.) just appeared? The scientific description is no more logical than the religious!The conclusion lies in the realms that science is just dipping one toe in; the idea that the Universe is ETERNAL and INFINITE!It would be un-scientific to exclude any possibility (either it is-or not;that is a 50-50 chance) WITHOUT RESARCHING it-as Albert said! Most of the modern physicists maintain that the universe has actually originated from nothing, thus requiring no supernatural agency for its creation. Here their logic is something like this: as they have found that the total energy of the universe is zero, so they have argued that no outside agent was at all necessary to provide the initial input energy for starting the universe; therefore, it can simply originate from nothing. If the total energy of the universe were having some very big non-zero value, then it would not have been possible for them to maintain that the universe had actually originated from nothing. Because in that case they would have to explain as to where all the energies of this universe had come from, because all those energies cannot simply come from nothing. However, the total energy being zero, this problem no longer bothers them. Although the total energy of the universe is always zero, still there are lots of energies in this universe, all originating from nothing in the form of positive and negative energies, thus keeping the total energy of the universe always zero. The same thing can be said about matter also. As the total matter of the universe is zero, so they say that all the matter of the universe can simply come from nothing, because zero does not have to come from anything. But what shall we have to say about space and time? Can nothing generate so much of space and time that we find in this universe? Or, was there some supernatural agent that had actually provided space and time to our universe? Or, would they say the same thing about space and time also that as the total space as well as the total time of the universe is indeed zero, so space and time can simply come from nothing? Was it then that space had actually originated from nothing in the form of positive space and negative space, thus keeping the total space of the universe always zero? Was it the same case for time also? Can it also be said about time that it has actually originated from nothing in the form of positive time and negative time, thus keeping the total time of the universe always zero? If there are negative space and negative time, then where are they? Are they in this universe? If they are not, then how come that so much of space and so much of time have simply come from nothing? Scientists believe that from nothing, nothing comes. The universe started with zero energy and zero matter, and its total energy and total matter always remain zero. Neither any extra energy nor any extra matter added to, or subtracted from, the initial zero value of them. So, from nothing, nothing has actually come. But if there is neither any negative space nor any negative time in our universe to counterbalance the positive space and the positive time respectively, then there is a real problem here. This is because here nothing has given rise to something really positive. To remove this imbalance in the quantity of space and time, scientist Victor J Stenger has proposed in an article (The Other Side of Time, 2000) that there is another side of time, opposite to our time axis. As our universe goes on expanding from zero time to positive infinity, so in the other side of time there is another universe that goes on expanding from zero time to negative infinity. If in our universe space and time are considered to be positive space and positive time, then in the universe located in the other side of time space and time can be considered to be negative space and negative time, thus keeping the total space and the total time always zero. Two objections can be raised against this proposed solution. First of all, this can never be verified, and Stenger himself admitted that: “…this scenario cannot be proven, just presented as a possibility that provides a non-supernatural alternative to the theistic creation.” This is tantamount to saying something like this: we suffer lots of injustice in our earthly life. All this will be properly compensated for in our heavenly after-life. Even if it is true, it can never be verified, and therefore it will be purely an act of faith if we accept it as true and live accordingly. So, we cannot accept Stenger’s proposal as a viable solution here, because it will also be an act of faith. The second objection is that initially both energy and matter were zero when the universe originated from nothing and that the total energy and the total matter of the universe always remain zero in this very universe. We have not gone to the other side of time for seeking a solution to any possible imbalance that could have arisen in the totality of these two entities. So, why should we have to go to the other side of time for setting right the imbalance that is definitely there in case of space and time? Why cannot the total space and the total time of this universe always remain zero in this very universe itself? Perhaps there is some substance in this universe that helps keep the total space and the total time of the universe always zero. At least Einstein’s general theory of relativity suggests something like that. At one place Einstein has written about GTR: “When forced to summarize the general theory of relativity in one sentence: Time and space and gravitation have no separate existence from matter.” If time and space and gravitation cannot have any separate existence from matter, then the total matter of the universe being always zero, the total time, the total space and the total gravitation of the universe should also always remain zero. Therefore we can say that there is definitely some substance in this universe due to the presence of which the total space and the total time of the universe always remain zero. And so, we need not have to go to the other side of time at all for setting right any imbalance or asymmetry that can be there either in case of space or in case of time. Due to the presence of this substance we can say that the universe starting from nothing with zero space, zero time, zero matter and zero energy will always contain zero total space, zero total time, zero total matter and zero total energy, thus not showing any asymmetry or imbalance anywhere. 4) From zero energy, so many forms of energy, the total energy always remaining zero. Something can appear out of nothing provided that the totality of that something always remains zero. Actually anything can come out of nothing if this condition is fulfilled. This is the principle which some scientists have relied upon when they have proposed that our universe could have arisen out of nothing due to a quantum energy fluctuation in a void. They have found that the total energy of the universe is exactly zero. The total energy being zero, the total matter will also be zero due to matter-energy equivalence. If the total matter as well as the total energy of the universe is zero, then why should they have to come from anything at all? They could have come from nothing as well. So these scientists have proposed that our universe has simply appeared out of nothing. But when they have proposed this theory, they remained totally oblivious of the fact that universe means not only its matter and energy, universe means its space-time as well. So, if the universe has actually appeared out of nothing, then just like matter and energy, space-time also has appeared out of that primordial nothing. So like matter and energy, the total space-time also should always remain zero. However, if it is the case that space-time has not directly appeared out of nothing, then the total space-time need not have to be zero. No sane person on this earth will ever say that the total number of human beings in this universe must always have to be zero, because no sane person believes that human beings have directly appeared out of nothing. However if ‘x’ has directly appeared out of nothing, then logic and common sense dictates that the totality of that ‘x’ must always have to be zero. Here it may be objected that there is a law of conservation of matter and energy in science, but that there is no such conservation law for space-time. So there is no violation of conservation law if nothing generates so much of space-time. Even if it is conceded that this is a valid objection – here I must say that I do not think so – it can still be pointed out that there is one more reason that can be given as to why the total space-time of the universe should always remain zero. This reason we find in Einstein’s general theory of relativity. As per GTR space, time and matter are so interlinked that there cannot be any space-time without matter. Similarly there cannot be any matter without space-time. There is also a famous quote of Einstein on this: “When forced to summarize the general theory of relativity in one sentence: Time and space and gravitation have no separate existence from matter.” If time and space cannot have any separate existence from matter, then the total matter of the universe being zero, the total space-time of the universe should also always be zero. So we can say that GTR alone gives us sufficient reason to conclude that if the total matter of the universe always remains zero, then the total space-time of the universe should also always remain zero. 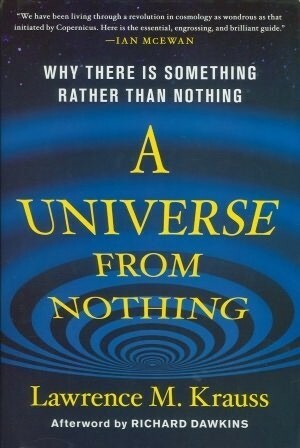 Here the question becomes quite irrelevant as to whether the universe has originated from something, or from nothing. If science cannot give any satisfactory answer to this question, then the atheistic, non-religious world-view of modern science will prove to be inadequate for explaining the real world..
My reading of Hawking is this: There was only energy, and that was unstable. All that energy and no matter. Being unstable couldn’t last, and BOOM!, matter was created during the big bang.